Warning: Harmless, self-serving self-promotion ahead. The Three are rarely interviewed, partly because we are such wall flowers (yeah, right). But mostly because we have such a difficult time getting our schedules to coordinate. Luckily for us, we got our act together long enough for our interview (as part of a feature on the best food blogs of the year 2009) on Yummy.ph. To check out some of the best in the local food blogsphere, please click here. Speaking of Yummy (this time the magazine), I wrote a short essay about learning how to bake my mother’s famous cheesecake for the holidays. If you have ever had a slightly overbearing parent teach you anything, this piece is for you. To date, this was the single most difficult (because I was perpetually questioning if I should write about such a personal moment) and the easiest piece (the words flowed right out of me; my first draft was done in less than hour) for me to write. Please pick up a copy of Yummy’s December issue, have a read and tell me what you think. I read your short essay. It was very inspring. I haven't baked cheesecakes yet but I know it needs a lot of patience. I can relate myself to you since I will also be making for the first time my mom's leche flan which its recipe was hand-me-down. Ayway, good luck in baking your mom's blueberry cheesecake this noche buena. Just like to say congrats for winning the recent 2009 Blog Awards. Congrats! the warning is very funny! 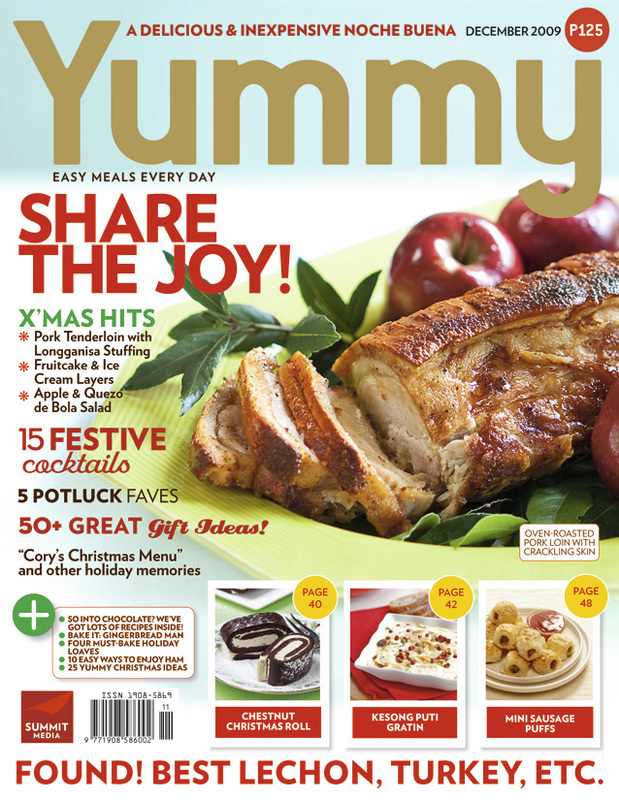 =) ill try to get a hold of yummy's december issue...i might just be surprisingly inspired to cook something for the holidays!